Donna May, a Republican, has been an elected Judge of the Allegany County Orphan's Court for 24 years, since 1986. On November 2, 2010 she was re-elected as the top vote-getter to another four-year term of office. 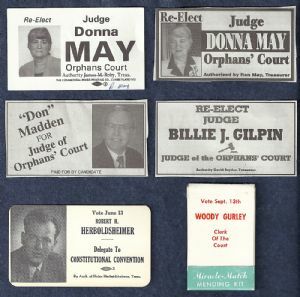 The early campaign card depicted here, next to an October 17, 2010 Cumberland Times-News election advertisement, is from 1990. In the November 4, 2014 General Election, Donna May was re-elected to another four-year term as Judge of the Orphans' Court. Donald Madden, a Democrat, was unsuccessful in his 2010 bid for election to the three-member Orphan's Court. Along with fellow Republicans May and Gilpin, Mark L. Widmyer was the third candidate elected to this office. Billie Gilpin, a Republican, had already served sixteen as a Judge of the Orphans' Court at the time of her re-election in the November 2010 General Election. In the November 4, 2014 General Election, Billie J. Gilpin was re-elected to another four-year term as Judge of the Orphans' Court. Robert "Spike" H. Herboldsheimer was a graduate of LaSalle High School and Frostburg State University. A former sheet metal worker, tin smith, and high school teacher, Herboldsheimer is perhaps best known for being a long-time community activist. Spike also belonged to the American Civil Liberties Union and the National Organization for Women. On June 13, 1967 he unsuccessfully ran as a Delegate from Allegany County to the Maryland Constitutional Convention of 1967-1968. The Convention itself convened in September 1967 and adjourned in January 1968 with the proposed constitution rejected by voters in May of that year. Helen Herboldsheimer, Spike's wife, served as his campaign treasurer. Woodrow "Woody" Wilson Gurley, a Republican, was a candidate in 1966 for the office of Allegany County Clerk of the Circuit Court. Though unsuccessful, he did give out a practical campaign item, this being "The Miracle-Match Mending Kit". The kit described itself as, "Almost a Miracle", with a "Miracle (transparent nylon) Thread that mends and blends perfectly with any color - even prints and plaids".